Helen was born on August 22, 1921 in Maple Creek Saskatchewan, and when 4 years old she moved with her parents and siblings to the Rimbey area. Helen attended Chapel School and Forshee High School, and worked for several neighbors as a domestic helper. She married Henry Frank in 1939 and they lived near a sawmill site west of Rimbey. Shortly after living there, a forest fire completely destroyed their home including all of their belongings, the entire sawmill and timber limits, and 4 other houses. This prompted a relocation to Bluffton followed by a move later to a farm southwest of Rimbey. In 1947 Helen and Henry bought a quarter of land in the Meadowbrook District, and in 1952 purchased land in the Wilmot District (Crestomere) where they farmed and also worked at the Rimbey Gas Plant for several years. They moved to Ponoka in 1973 and Helen worked for five years at the Alberta Hospital prior to her retirement. In 2003 Helen moved into Legacy Place and later into Rimoka Lodge. 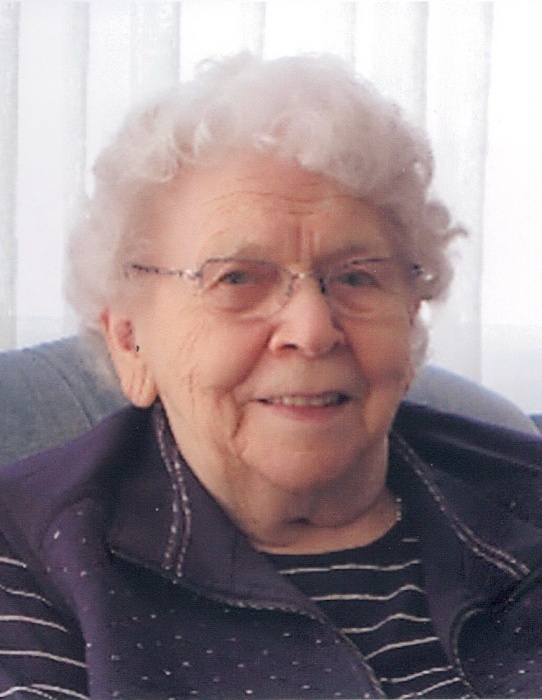 Due to failing health, she became a resident in the Lacombe Hospital and Care Centre in 2014 where she resided until her passing. Helen excelled at cooking. She thoroughly enjoyed picking berries and gardening, and won many prizes at horticultural shows for her vegetables, fruits, and flowers. She took great pleasure in growing her mini indoor African violet garden. She really loved nature. Helen started painting pictures for a hobby during her retirement and became an excellent artist. But without any doubt, Helen's biggest pride and joy were her grandchildren and great-grandchildren, and she always was keenly interested in their lives and accomplishments. Helen will be dearly missed by her family and friends, and she will be remembered for her generous heart, and her witty and humorous personality. Helen is survived by her four children: Royce (Linda) Frank, Keith Frank, Myra (Adolf) Raugust, and Carol (Ed) Lukat; six grandchildren: Neil (Kendra) Frank, Kevin Frank, Carmen (Graeme) Parkins, Darrell Raugust, Janice (Neil) Ewart, and Tricia (Dean) Mrozowich; seven great-grandchildren: Carson, Leah and Kyla Frank, Naomi and James Parkins, Emma and Brady Ewart; and numerous nieces and nephews. She was predeceased by her husband Henry Frank in 1981; parents Christian and Wilhelmina Odenbach; brothers Ben, Reinhold, Albert and Ruben Odenbach; and sisters Martha Allison, Ella Prentice, and Ruth Williams. A Funeral Service will be held on Saturday, April 21, 2018 at 1:00 p.m. at the Trinity Evangelical Lutheran Church, 5501-54 Avenue, Ponoka with the Interment to follow in the Ponoka Forest Home Cemetery. In lieu of flowers, memorial contributions may be made to any charity.